The historic Chelsea Barracks have been sold for £959m in the UK's most expensive home property deal. The 12.8-acre site between Sloane Square and the River Thames has been bought by the Qatari government and the Candy brothers for redevelopment. At £75m per acre, the plot cost four times the original estimate. The money will be used for military accommodation to "rectify decades of neglect". The barracks were put on the market by the Ministry of Defence (MoD) in 2005. It was valued at by the Government's National Asset Register at £58.3m and the MoD had expected to get £300m from the sale. 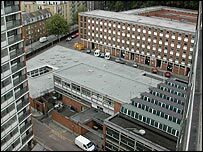 The barracks, which were built in the 1960s and considered an eyesore, had housed four companies from the Foot Guards, the Coldstream Guards and the Scots Guards. They will be demolished and replaced with up to 2,000 luxury homes. An MoD spokesperson said: "Proceeds from the sale of the barracks are ring-fenced for investment in accommodation in recognition of the priority that the MoD places on rectifying decades of neglect." The consortium of buyers, named Project Blue (Guernsey Ltd), is led by the Qatari Diar Real Estate Investment Company, a branch of the Qatari Government's Qatari Investment Authority. The consortium exchanged contracts with the MoD last April and completed on Thursday, with payment spread over five years. When fully developed the site, which has almost 150 years of links with the military, could be worth several billion pounds. Tania Fawcett, head of marketing at Candy and Candy said: "We understand this to be Britain's most expensive property deal."